Previously – Heimdall has been loyal in the past and proved once more he could still be loyal (to the highest bidder). Currently – Lectures. There’s nothing more exciting in the vast realms of education. I’m glad it was all good. 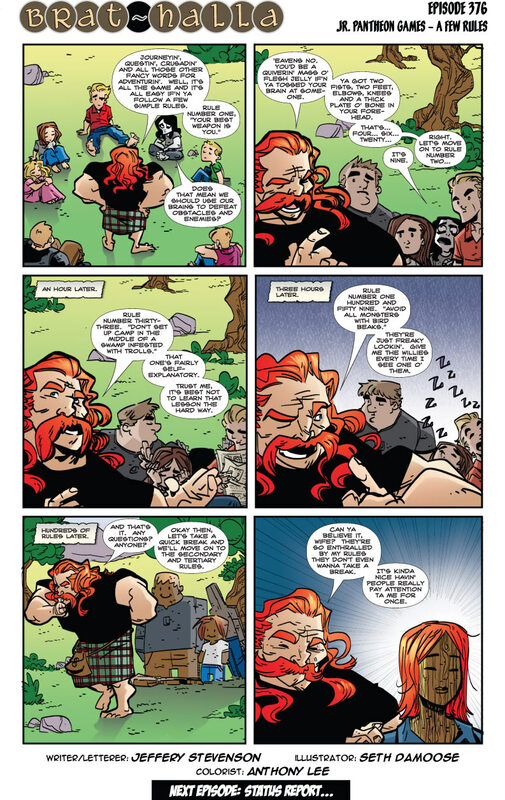 Of course, the Scotsman does not realize that with Hod, his brain IS his weapon of choice. But then, he does not realize that everyone there, INLCUDING his companion, have replaced themselves with wooden statues and cutouts. But then, he did not realize that everyone had stopped paying attention to his rules by number 10, if that long. But what if he does realize no one’s really paying attention to him but just likes talking anyways? LOL. Swamps. Trolls. Good Times. Bop! Ladies and gentleman, give a warm welcome to one of the best DMs I’ve had the honor of playing D&D with (he was a really good player too). Lots of little references in Brat-halla originated in campaigns he ran… The above lesson on camping in troll-infested swamps, Inn of the Windy Dog, Arazel and Xarenia would be just a few of those. Actually, the reference to the Ancients in my last post has spurred me to ask a question that, while not exactly keeping me up at night, has made me wonder. Apologies if this has been covered/explained already somewhere, but in what time period (in Midgard terms) is Brat-halla set? BTW, any answer from “Dude, shut the f%# up, it’s a comic strip ferthorssake,” to a treatise on the non-relativistic temporal relationship bewteen Asgard, Midgard and the rest of the Nine Worlds is fine by me. You guys created this; it is whatever you say it is! As always, the simplest answer is the most elegant. Love the fact that no one ever notices when someone is replaced by a wooden board with a smiley on it.